Let's see..multiple yelling men accost 3 young women in a grocery store parking lot at night, and they fairly predictably panic and try to flee. Result? A night in jail and charges for 3 felonies. They should consider themselves lucky that she only grazed them with her vehicle. I've taught my daughter that another name for an automobile is "2 ton battering ram". You have to wonder just how the Virginia ABC morons would have reacted if she had been a concealed carrier and had defended herself. Well, no, I guess you don't. We'd have wound up with some dead sorority girls and an investigation that patted them on the back for doing a good job in difficult circumstances. Don't even try to tell me we don't live in a police state. I'm just going to laugh at you. We're all guilty--guilty as hell of 3 felonies a day. Most of us just get away with our "crimes". The only good news is that the prosecutor had a fit of good sense and dismissed the charges. Claire Wolfe directs us to HTTPS Everywhere, available for Firefox and Chrome. It forces a secure connection every time if can, even if you don't specifically ask for it. Many other good tidbits in the entire post. 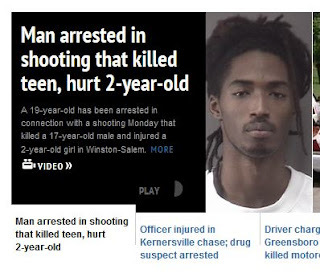 "Man arrested in shooting that killed teen, hurt 2-year-old"
So if you're 19 and you're the shooter, you're a man. If you're 19 and the shootee, you're a teenage victim of gun violence. Glad we got that cleared up. I just haven't been in the blogging mood, whatever that is. Been Tweeting some things (to the 4 followers I have), but nothing so far has really moved me to post. So I am going to resort to the time-honored tactic of directing you to other people's sites. From the comments at Tam's, Legal Insurrection's coverage of the George Zimmerman trial. Old NFO's tales of Real Customer Service. If they're not true they should be. Michael Bane goes on a rant. Any rant that includes quotes from Neils Bohr is worth your time. Not from a blog; a real-life story of what it took to feed 6 people for 10 months. Brigid talks about clothes lines. I'm going down to the basement and see if I can do something semi-useful.